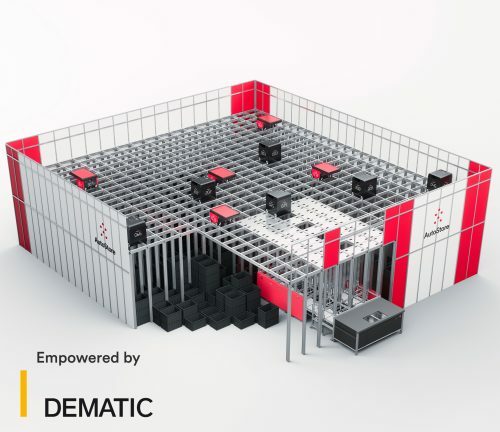 Dematic is to offer AutoStore’s revolutionary new Black Line cube-storage solution – designed for applications requiring very high throughputs. The newly introduced high-density storage and retrieval system follows similar operating principles to AutoStore’s successful Red Line solution, but critically, incorporates significant design innovations that make it far faster and efficient at processing large order volumes. Designed to be complementary systems capable of integration as a single solution, both the Red Line R5 and the new Black Line B1 robot can operate together on a new double-double grid system, making upgrades attractive. Black Line brings together a number of technological advances – an ultra-compact robot design that retains the bin within its body, direct drive technology for faster acceleration, quick battery change for continuous uptime, an advanced double-double grid format for greater flexibility and ease of travel, a deeper bin size for carrying larger products and a new workstation concept for higher throughput capacity. Robot Cavity Design: The B1 robot is almost half the size of the R5 and is designed to carry a bin within the body of the vehicle – saving cube space and making more room for other busy robots. The higher body cavity enables it to carry taller bins up to 425mm. With a top storage layer for digging and sorting, no bins block the grid, allowing for more sophisticated route planning and higher speeds. Continuous Power: Maximum uptime is assured through the use of Lithium-ion batteries and patented BattPackTM technology, which allows robots to pick up a fully charged battery whenever needed. Direct Drive Technology: Using individual direct drive motors in each wheelbase, and removing the need for drive belts, the B1 accelerates 75% faster than the R5 and on average delivers a 20% higher performance. Double-Double Grid: The new double-double grid design includes double tracks in both X and Y direction – a significant advance over the single-double grid. Importantly, both R5 and B1 robots work on the new grid. The new design provides a highway for robots to cross each other, freeing movement and facilitating faster throughput. Workstation – RelayPort: To significantly increase throughput at workstations, a new concept, RelayPort, allows each picking module to be served by three to six buffer modules, with put positions accessible by robot from any direction. With six buffer modules a RelayPort can handle up to 650 bins per hour, if served by a B1 robot – up to 450 bins per hour with the R5.